Colgate's #brushswap promotion, which had to be scrapped after the brand couldn't keep up with consumer demand, has been banned by the ad watchdog for making misleading claims. The experiential work, which was promoted by a print ad on the front of the London Evening Standard, promised to swap people’s electric toothbrushes for a Colgate Proclinical A1500 model, purportedly worth £169.99. The ad promoting the activity stated: "Swap your electric toothbrush at Waterloo station tomorrow... Toothbrushes must be electric and rechargeable to qualify and stocks are limited to 750 a day. One brush per person." The promotion, intended to last a week, backfired on Colgate when the brand was overwhelmed with consumers on its first day. 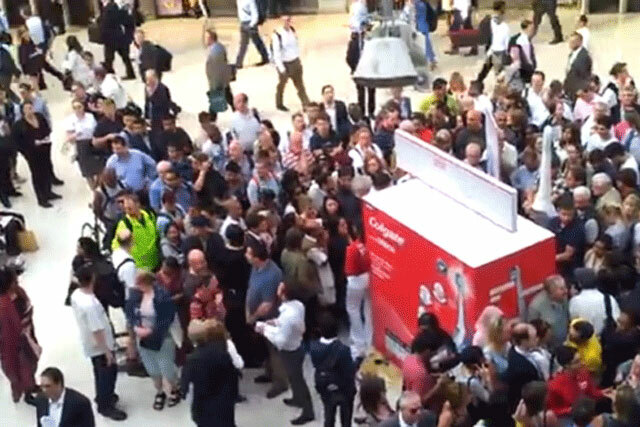 People had started queuing at the station at 5am on 9 July, two hours before the promotion opened, and Colgate was forced by Network Rail staff to scrap the entire stall within an hour of opening. One person complained about the promotion and its supporting ad work, challenging that Colgate breached the code because the complainant had attended the stand and had been unable to get a toothbrush; that it was in breach for not stating the opening times of the promotion; and that the "worth £169.99" claim was misleading as the brushes were usually sold at a lower price. Despite Colgate’s claims that it had enough product to meet demand, that it did not need to state the opening times of the stand and that the price claim was not misleading, the Advertising Standards Authority banned the ad. It said Colgate’s estimated demand for #brushswap was not reasonable, that not displaying the opening and closing times of the stand was misleading, as was the use of a £169.99 price mark, when the toothbrush in question was found to be sold for a large part of the year at £84.99 or less.